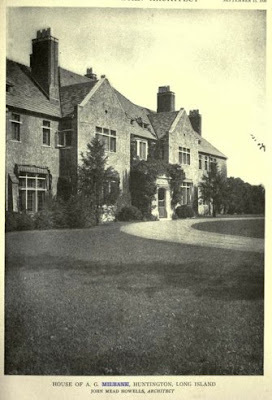 'Panfield', the Albert Goodsell Milbank estate designed by John Mead Howells (of Howells & Stokes) c. 1915 in Lloyd Harbor with landscaping by John Jacob Levison and Lewis & Valentine (on roughly 300 acres). Milbank was a partner in the law firm Milbank, Tweed, Hope & Hadley and was chairman of the board of Borden Company. Along with J.D. 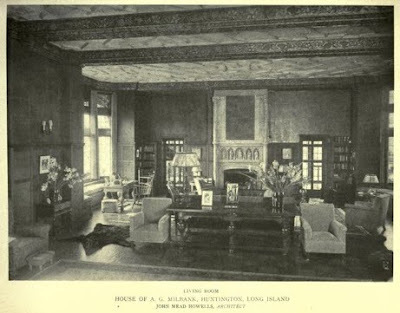 Rockefeller Jr., the two worked with the United War Work Campaign during World War I and Milbank was decorated by King Alexander of Serbia in 1922 for his post war relief efforts. He was also a director and vice-president of the Welfare Council and was awarded their first annual medal for distinguished service in 1945. 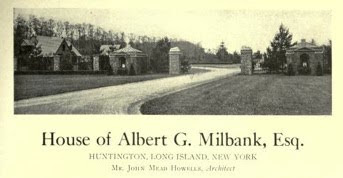 Milbank was a founder and mayor of the Village of Lloyd Harbor, a position which he held from incorporation in 1927 until 1947. He died in 1949 at the age of 76. Click HERE to see 'Panfield' on google earth. 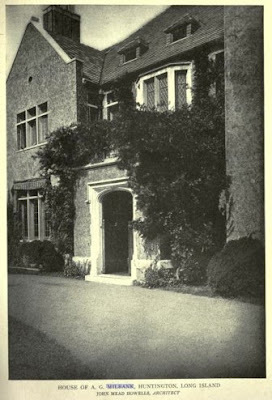 Click below to see 'Panfield' intact before the property was subdivided in a 1953 aerial shot. 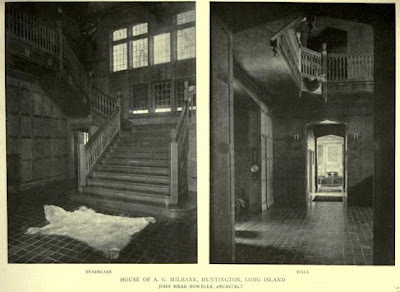 Pictures from American Architect and Architecture, 1920. Panfield is going to be on the Huntington Historical Society house tour on Sunday, 12/6. It will be a rare opportunity to see the house now owned by Bernadette Castro.